Erasistratus (/ˌɛrəˈsɪstrətəs/; Greek: Ἐρασίστρατος; c. 304 – c. 250 BC) was a Greek anatomist and royal physician under Seleucus I Nicator of Syria. Along with fellow physician Herophilus, he founded a school of anatomy in Alexandria, where they carried out anatomical research. He is credited for his description of the valves of the heart, and he also concluded that the heart was not the center of sensations, but instead it functioned as a pump. Erasistratus was among the first to distinguish between veins and arteries. He believed that the arteries were full of air and that they carried the "animal spirit" (pneuma). He considered atoms to be the essential body element, and he believed they were vitalized by the pneuma that circulated through the nerves. He also thought that the nerves moved a nervous spirit from the brain. He then differentiated between the function of the sensory and motor nerves, and linked them to the brain. He is credited with one of the first in-depth descriptions of the cerebrum and cerebellum. Erasistratus is generally supposed to have been born at Ioulis on the island of Ceos, though Stephanus of Byzantium refers to him as a native of Cos; Galen, as a native of Chios; and the emperor Julian, as a native of Samos. Pliny says he was the grandson of Aristotle by his daughter Pythias, but this is not confirmed by any other ancient writer; and according to the Suda, he was the son of Cretoxena, the sister of the physician Medius, and Cleombrotus. From the latter it is not quite clear whether Cleombrotus was his father or his uncle. He was a pupil of Chrysippus of Cnidos, Metrodorus, and apparently Theophrastus. He lived for some time at the court of Seleucus I Nicator, where he acquired great reputation by discovering the disease of Antiochus I Soter, the king's eldest son, probably 294 BC. Seleucus in his old age had lately married Stratonice, the young and beautiful daughter of Demetrius Poliorcetes, and she had already borne him one child. Antiochus fell violently in love with his mother-in-law, but did not disclose his passion, and chose rather to pine away in silence. The physicians were quite unable to discover the cause and nature of his disease, and Erasistratus himself was at a loss at first, till, finding nothing amiss about his body, he began to suspect that it must be his mind which was diseased, and that he might perhaps be in love. Erasistratus confirmed his conjecture when he observed that the skin of Antiochus grew hotter, his colour deeper, and his pulse quicker whenever Stratonice came near him, while none of these symptoms occurred on any other occasion. Accordingly, he told Seleucus that his son's disease was incurable, for he was in love, and that it was impossible to gratify his passion. The king wondered what the obstacle could be, and asked who the lady was. "My wife," replied Erasistratus; upon which Seleucus began to persuade him to give her up to his son. The physician asked him if he would do so himself if it were his wife that the prince was in love with. The king protested that he would most gladly; upon which Erasistratus told him that it was indeed his own wife who had inspired his passion, and that he chose rather to die than to disclose his secret. Seleucus was as good as his word, and not only gave up Stratonice, but also resigned to his son several provinces of his empire. 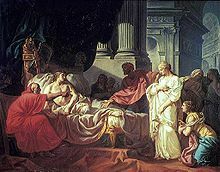 This celebrated story is told with variations by many ancient authors, and a similar anecdote has been told of Hippocrates, Galen, Avicenna, and (if the names be not fictitious) Panacius and Acestinus. If this is the anecdote referred to by Pliny, as is probably the case, Erasistratus is said to have received one hundred talents for being the means of restoring the prince to health, which would amount to one of the largest medical fees upon record. Very little more is known of the personal history of Erasistratus: he lived for some time at Alexandria, which was at that time beginning to be a celebrated medical school, and gave up practice in his old age, that he might pursue his anatomical studies without interruption. He and fellow physician Herophilus practiced anatomy with great success, and with such ardour that they are supposed to have dissected criminals alive. Erasistratus appears to have died in Asia Minor, as the Suda mentions that he was buried by mount Mycale in Ionia. The exact date of his death is not known, but he probably lived to a good old age, as, according to Eusebius, he was alive 258 BC, about forty years after the marriage of Antiochus and Stratonice. He had numerous pupils and followers, and a medical school bearing his name continued to exist at Smyrna in Ionia nearly till the time of Strabo, about the beginning of the 1st century. The following are the names of the most celebrated physicians belonging to the sect founded by him: Apoemantes, Apollonius Memphites, Apollophanes Artemidoras, Charidemus, Chrysippus, Heraclides of Smyrna, Hermogenes, Hicesius, Martialius, Menodorus, Ptolemaeus, Strato, Xenophon. An attack on Erasistratus and his followers is preserved in Anonymus Londinensis. Erasistratus wrote many works on anatomy, practical medicine and pharmacy, of which only the titles remain, together with a great number of short fragments preserved by Galen, Caelius Aurelianus, and other ancient writers. These, however, are sufficient to enable us to form a reasonable idea of his opinions both as a physician and an anatomist. It is as an anatomist that he is most celebrated, and perhaps there is not one ancient physician that did more to promote that branch of medical science than he. The vein arises from the part where the arteries, that are distributed to the whole body, have their origin, and penetrates to the sanguineous [or right] ventricle [of the heart]; and the artery [or pulmonary vein] arises from the part where the veins have their origin, and penetrates to the pneumatic [or left] ventricle of the heart. The description is not very clear, but seems to show that he supposed the venous and arterial systems to be more intimately connected than was generally believed. This idea is confirmed by another passage in which he is said to have differed from the other ancient anatomists, who believed that the veins arise from the liver, the arteries arise from the heart and the heart is the origin both of the veins and the arteries. With these ideas, it can have been only his belief that the arteries contained air and not blood, that hindered his anticipating Harvey's discovery. The tricuspid valves of the heart are generally said to have derived their name from Erasistratus. This, however, appears to be an oversight, as Galen attributes it not to him, but to one of his followers. Erasistratus also appears to have paid particular attention to the anatomy of the brain, and in a passage from his works preserved by Galen he speaks as if he had himself dissected a human brain. Galen says that before Erasistratus had more closely examined into the origin of the nerves, he imagined that they arose from the dura mater and not from the substance of the brain; and that it was not until he was advanced in life that he satisfied himself by actual inspection that such was not the case. According to Rufus of Ephesus, he divided the nerves into those of sensation and those of motion, of which the former he considered to be hollow and to arise from the membranes of the brain and the latter from the substance of the brain itself and of the cerebellum. He asserted that the spleen, the bile, and several other parts of the body, were entirely useless to animals. Erasistratus believed that fluids, when drunk, passed through the esophagus into the stomach. During his time, there was controversy that was carried on as to whether fluids when drunk passed through the trachea into the lungs, or through the esophagus into the stomach. He is also supposed to have been the first person who added to the word arteria, which had hitherto designated the canal leading from the mouth to the lungs, the epithet tracheia, to distinguish it from the arteries, and hence to have been the originator of the modern name trachea. He attributed the sensation of hunger to emptiness of the stomach, and said that the Scythians were accustomed to tie a belt tightly round their middle, to enable them to abstain from food for a longer time without suffering inconvenience. The pneuma (spiritual substance) played a very important part both in his system of physiology and pathology: he supposed it to enter the lungs by the trachea, thence to pass by the pulmonary veins into the heart, and thence to be diffused throughout the whole body by means of the arteries; that the use of respiration was to fill the arteries with air; and that the pulsation of the arteries was caused by the movements of the pneuma. He accounted for diseases in the same way, and supposed that as long as the pneuma continued to fill the arteries and the blood was confined to the veins, the individual was in good health; but that when the blood from some cause or other got forced into the arteries, inflammation and fever was the consequence. Of his method of cure the most remarkable peculiarity was his aversion to bloodletting and purgative medicines: he seems to have relied chiefly on diet and regimen, bathing, exercise, friction, and the most simple vegetables. In surgery he was celebrated for the invention of a catheter that bore his name, and which was S-shaped. ^ Suda, Erasistratos; Strabo, x. ^ Galen, de Sang, in Arter. c. 7, vol. iv. p. 729. ^ Plutarch, Demetr. c. 38; Appian, de Rebus Syr. c. 59. ^ Heliod. Aethiop. iv. 7. ^ Galen, de Hippocr. et Plat. Decr. vii. 3, vol. v. p. 602. ^ Celsus, de Medic. i. praef. ^ Galen, de Hippocr. et Plat. Decr. vi. 6, vol. v. p. 552. ^ Smith, W., ed., Dictionary of Greek and Roman Biography and Mythology, vol. 2 (Boston: Little, Brown and Company, 1867), p. 43. ^ Galen, De Hippocr. et Plat. Decr. vi. 6, vol. v. p. 548. ^ Rufus of Ephesus, De Appell. Part. etc. p. 65. ^ Plutarch, Symposium, vii. 1; Aulus Gellius, xvii. 11; Macrobius, Saturn. vii. 15. ^ Aulus Gellius, xvi. 3. ^ Galen, de Venae Sect. adv. Erasistr. c. 2. vol. xi. p. 153, etc. ; Pseudo-Plutarch, de Philosoph. Plac. v. 29. ^ Galen, Introd. c. 13. vol. xiv. p. 751. This article incorporates text from a publication now in the public domain: Smith, William, ed. (1870). "Erasistratus". Dictionary of Greek and Roman Biography and Mythology. 2. pp. 42–44. Brain, Peter (1986). Galen on bloodletting : a study of the origins, development, and validity of his opinions, with a translation of the three works. Cambridge: Cambridge University Press. ISBN 0-521-32085-2. Fraser, P. M. (1969). "The Career of Erasistratus of Ceos" (PDF). Istituto Lombardo, Rendiconti. 103: 518–537. Archived from the original (PDF) on 2011-08-27. Galen (1984). Furley, David J.; Wilkie, J.S. (eds.). Galen on respiration and the arteries. Princeton, NJ: Princeton University Press. ISBN 0-691-08286-3. Galen (1984). De Lacy, Phillip (ed.). On the Doctrines of Hippocrates and Plato (3rd ed.). Berlin: Akademie-Verlag. Galen (1916). On the natural faculties. Arthur John Brock, trans. London: W. Heinemann. ISBN 0-674-99078-1. Galen (1985). Three treatises on the nature of science. Michael Frede and Richard Walzer, trans. Indianapolis: Hackett. ISBN 0-915145-91-X. Harris, C. R. S. (1973). The heart and the vascular system in ancient Greek medicine. From Alcmaeon to Galen. Oxford: Clarendon. ISBN 0-19-858135-1. Lloyd, G. E. R. (1975). "A Note on Erasistratus of Ceos". Journal of Hellenic Studies. 95: 172–175. doi:10.2307/630879. Lonie, I. M. (1964). "Erasistratus, the Erasistrateans, and Aristotle". Bulletin of the History of Medicine. 38: 426–443. Smith, W. D. (1982). "Erasistratus's dietetic medicine". Bulletin of the History of Medicine. 56 (3): 398–409. PMID 6753988.
von Staden, Heinrich (1975). "Experiment and Experience in Hellenistic Medicine". Bulletin of the Institute of Classical Studies. 22 (1): 178–199. doi:10.1111/j.2041-5370.1975.tb00340.x. This page was last edited on 6 December 2018, at 18:27 (UTC).